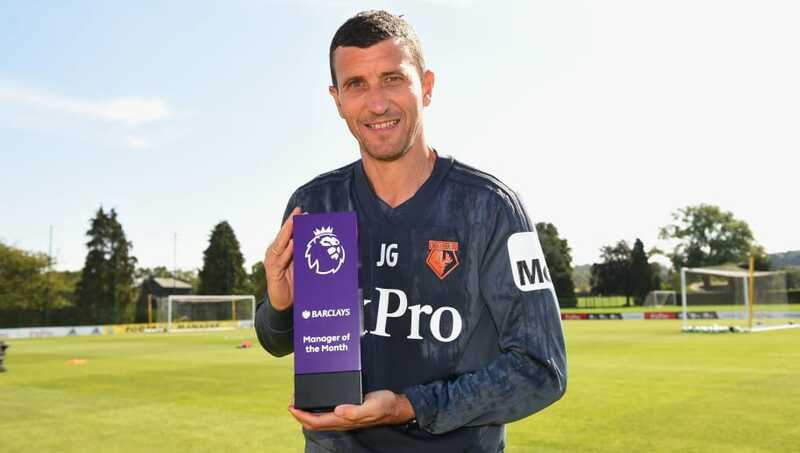 ​Watford boss Javi Gracia has been named Premier League Manager of the Month for August after his team's incredible start to the new 2018/19 season. The Hornets have won all four Premier League games they have played so far and Gracia has been awarded the prize ahead of Jurgen Klopp, Mauricio Pochettino and Maurizio Sarri.  | Congratulations to Javi Gracia, who has been awarded the @BarclaysFooty's @PremierLeague Manger of the Month for August! Having beaten Brighton, Burnley and Crystal Palace to take maximum points from their first three fixtures, Watford then pulled off a comeback victory over Tottenham last weekend to finish August with a 100% winning record. Liverpool and Chelsea are the only two other clubs to boast the same impressive record four games in and goal difference is all that is keeping Gracia's Watford off the top of the table. The 48-year-old is the first Watford boss to win a Manager of the Month award since fellow Spaniard Quique Sanchez Flores received it for December 2015. "I am very pleased. We are enjoying [it]. You never know what will happen," Gracia told the Premier League's official website. With domestic football currently paused for the international break, Watford's next fixture will them face Manchester United at Vicarage Road on Saturday 15 September.